I don’t know whether Raju Hirani has actually seen Tapan Sinha’s Bengali film Golpo Holeo Satti, which was remade in Hindi by Hrishikesh Mukherjee as Bawarchi, starring Rajesh Khanna. In that film, a God sent servant played brilliantly by Robi Ghosh, arrives as a messiah and brings harmony and order in a big, quibbling joint family. I felt the character Rancho essayed by Amir Khan in this film has a lot in common with that character, the difference being here the protagonist espouses the cause of true education by following one’s dreams. 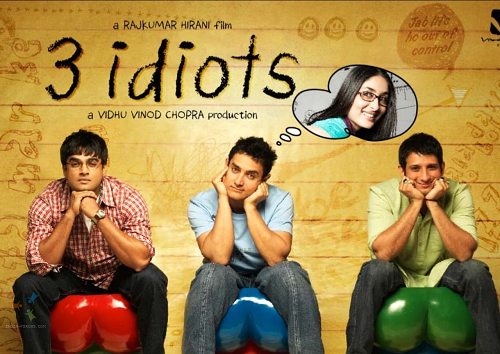 Amir is shown as an exceptionally gifted student who tops in academics without actually sitting down with books, all the while poking fun at his Professor (Boman Irani) who is a Hitler in the eyes of the student, or the nerdy type students like Chatur Ramalingam (Om Vaidya). One also detects a certain change in recent Bollywood films, which have discarded its overt puritanical image seen in the films of the 50s-70s & embracing a certain boldness in terms of language, depiction of scenes that may include smooching, shots of protagonist in the loo, or pulling one’s pants down as a mark of gratitude – so much in evidence in this film as well.